Your goals for the next 30 days. First I’m going to reflect in these last 30 days. I was not happy with the topics in this particular blog challenge, but I think I have a few ideas about how to turn the posts around into actual, interesting, readable material. I’ll let you know more as I hash it out. But my next thirty day challenge is going to be a fun one. The purpose of this first thirty day challenge was to make blogging more of a habit. The purpose of the next 30 days will be to make exercise more of a habit. I exercise fairly often, but it’s usually one of three go to workouts. As I’m getting older they’re just not cutting it anymore. So to mix things up, I’m going to do 30 different YouTube workouts in 30 days. By the end of the month, I’ll come away with at least a few news routines or ideas on how to get some variety in my exercise plan! I’ll post the links here and a quick review of each video. This is probably a pretty boring answer, but I’d probably invest it for a few years and live off the interest. Eventually I’d pay off the house, do some house repairs (scratch that, PAY someone to do the repairs), give money to family, make donations, and write fiction full time while I traveled. Where you’d like to be in 10 years? 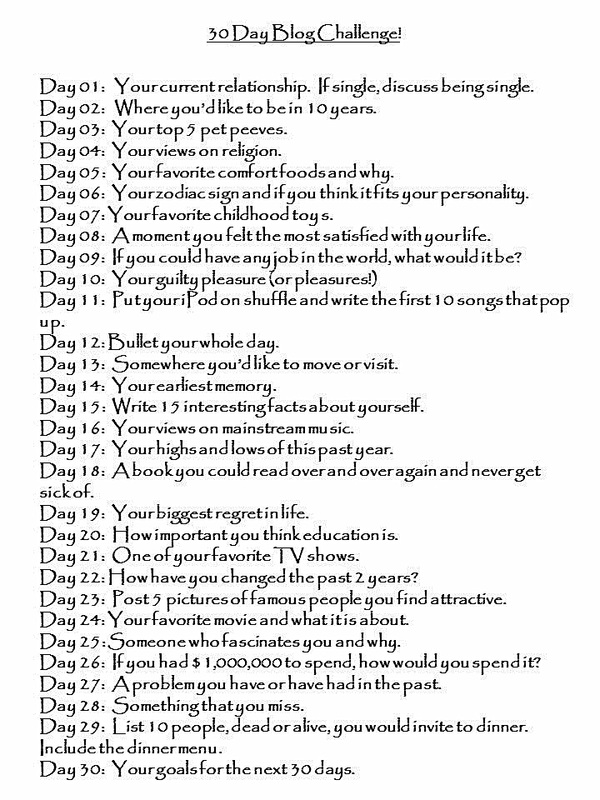 This is a better question than the first day prompt. I think I was so frustrated by how inane Day 1 was that I almost gave up. But I’ll make it up now. In 10 years I’d like to have a few books published and be making a comfortable living as a full-time writer. I hope to still be as happy with my relationship as I am today. My dogs will be seniors and we’ll spoil them rotten everyday. My nephew will be 10 1/2 years old, a healthy, smart, happy boy who loves his tia. I hope to make more time for volunteering and bettering the community. I hope by then I know more of my neighbors. I guess I don’t really want anything too big or too crazy. I just want to be healthy and happy, surrounded by people and dogs I love and doing things that matter. Prompt: Your current relationship status. If single, discuss being single. Right away this blog challenge irks me. Why should we single out single people? Why can’t married, divorced, dating, asexual people discuss, too? My relationship status is not something that should concern others. So there you go! Welcome back to blogging, Amanda. When I get an idea, I have trouble not following through with it right away. I think that’s why I have so many first drafts and not so many completed manuscripts. I love to follow up on new things. When I get an inkling of something, I get a little obsessed with doing it or finding out more. I wrote last time about pursuing other avenues of writing, just to see what’s out there. I have a few great friends who make their livings as freelance writers and they’ve been nice enough to share (or plan to share) some of the ways they do it. I’m not looking to write fulltime, yet. If (and when) I do it will be because of my fiction writing, I hope. But in the meantime, I’ve been exploring some options for getting a wider audience and doing different types of writing. This morning I completed my first web content job. It was writing copy for a few sections of a website. The guidelines were intense and it took me awhile to wrap my head around what they really wanted from me. But once I got into it, it was actually pretty fun. I think I’ll keep my day job and even put my fiction writing first, but it’s nice to know there are writing opportunities out there that pay, if you’re looking. Some other great advice I got was to volunteer to blog for nonprofits. In those cases you can usually use your own name, which means I can add the clips to my portfolio. So I reached out through http://www.volunteermatch.org and made a connection. The editor liked my ideas for the blog, so I’m sending her some rough outlines this weekend. I hope my next post here will direct you to read another post of mine at a beautiful and important website! My brain feels like it’s dancing with all the writing possibility and opportunities out there. Are you pursuing freelance work? Do you write full-time? How did you get into it?